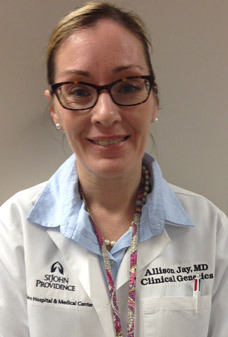 Allison Jay, M.D. works for the Cancer Genetics Program at St. John Hospital and the Van Elslander Cancer Center. She is certified in clinical genetics and medical biochemical genetics by the American Board of Medical Genetics and Genomics. Prior to her arrival to the Van Elslander Cancer Center, ... Read More Dr. Jay completed a resident at Detroit Medical Center where she worked with cancer patients at Karmanos Cancer Institute. She then completed a fellowship at the Mayo Clinic in Biochemical genetics. Dr. Jay is an adjunct faculty member at Wayne State, where is involved in teaching the year one medical students introduction to genetics course. In addition, Dr. Jay is involved in the St. John Obstetrics and Gynecology residents training, as well as mentoring genetics counseling students from Wayne State who rotate through the Cancer Genetics Department. Dr. Jay has special interest in breast cancer, colon cancer, and genetic syndromes and has several presentations in those areas at national meetings. Dr. Jay is a member of several professional societies, including the American Medical Association (AMA), American College of Medical Genetics (ACMG) and the Society for Inherited Metabolic Disorders (SIMD). Dr. Jay received her medical degree from the University of Chicago Pritzker School of medicine and completed a medical genetics resident at Detroit Medical Center. Allison Jay, MD offers services at multiple MI locations.